Packaging Designs: Mostly people judge the quality of product with its unique packaging. In this post we present excellent examples of beautiful, attractive and communicative packaging design. Effective packaging design breaks away from the standard rules and conventions that we are accustomed to, giving the product a unique edge to stand out from the rest. Marketing and designers have tremendous power to grab customer’s interest with their skills and creativity ideas. 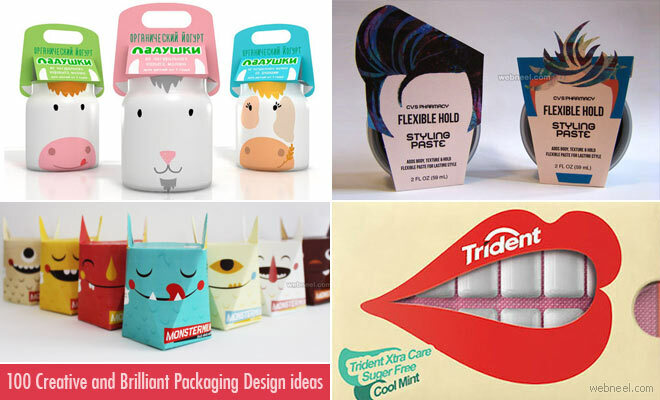 With the use of illustration, color, typography and even various packaging materials, a beautiful and attractive packaging can boost the selling and stands out from the rack of competitors. i hope you will like these brilliant packaging design inspiration examples. 100 Creative and Brilliant Packaging Design ideas from around the world Neel Packaging Designs: Mostly people judge the quality of product with its unique packaging. In this post we present excellent examples of beautiful, attractive and communicative packaging design.